Inspired by the same society that gave rise to Christopher Isherwood's 'Berlin Stories', the drawings in George Grosz: THE BIG NO present a caustic, comic view of Germany in the troubled years of the Weimar Republic. Ranging from primitive and graffiti-like drawings to complex Futuristic street scenes with teeming crowds of overlapping figures, this collection shows Grosz at the height of his satirical powers, through a selection of works from his largest portfolio 'Ecce Homo'. Pimps, black-marketeers, prostitutes, demobbed soldiers and the nouveau riche rub shoulders in drawings of razor-sharp acuity and technical precision. Also included are the powerful, anti-militarist 'Hintergrund' drawings, originally published in 1928 to accompany Erwin Piscator's production of 'The Good Soldier Svejk', which resulted in criminal charges being brought against Grosz for 'blasphemy and defamation of the German military'. 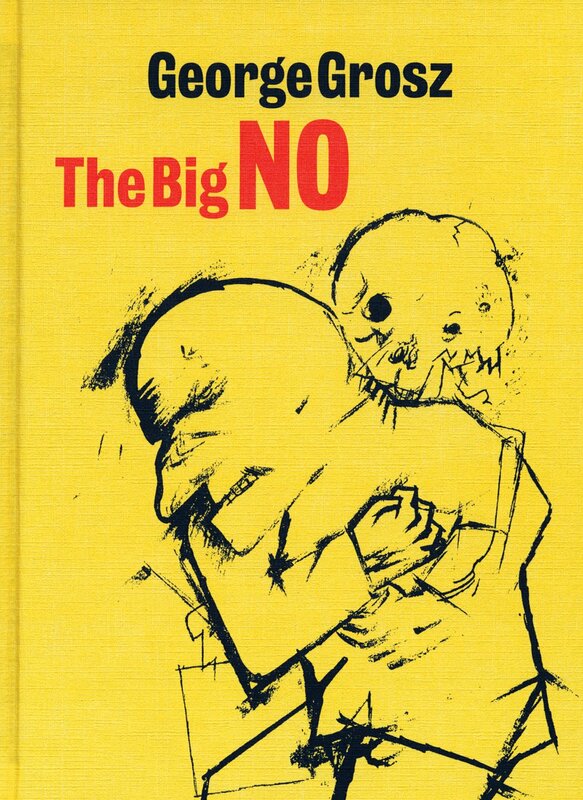 George Grosz: THE BIG NO will be a welcome addition to the very limited number of titles available on this fascinating and influential artist. With informative text by Lutz Becker and a striking, contemporary design by Richard Hollis, the title is an essential guide to one of the twentieth century's most important satirists. Ciprian Mureşan (b.1977, Dej) lives and works in Cluj. Graduated from Academy of Fine Arts, Cluj-Napoca, Cluj (2003); and The University of Art and Design, Cluj (2001). Select solo exhibitions include Ciprian Mureșan, Nicodim Gallery, Los Angeles (2018); Art Club 22: Ciprian Mureșan, Accademia di Francia a Roma, Villa Medici, Rome (2018); Ciprian Mureșan: All Images from a Book…, David Nolan Gallery, New York (2017); Ciprian Muresan, Ludwig Museum-Museum of Contemporary Art, Budapest (2015); Stage and Twist, Project Space, Tate Modern, London (2012); Recycled Playground, FRAC Champagne-Ardenne, Reims and touring (2011); and Ciprian Mureșan, n.b.k., Neuer Berliner Kunstverein, Berlin (2010). Select group exhibitions include A Slice through the World: Contemporary Artists’ Drawings, Drawing Room, London and Modern Art Oxford, Oxford (2018); Acquisitions récentes du Cabinet d’Art Graphique, Centre Georges Pompidou, Paris (2018); VIVA ARTE VIVA, the 57th edition of the Venice Biennale exhibition, Venice (2017); Freundschaftsspiel Istanbul: Freiburg, Museum fur Neue Kunst Freiburg, Freiburg (2017); Shape of Time – Future of Nostalgia, Works from Art Collection Telekom, National Museum of Contemporary Art, Bucharest (2017); Drawing Biennial 2017, Drawing Room, London (2017); Without Reality There is No Utopia, Centro Andaluz de Arte Contemporaneo, Sevilla (2011); and No New Thing Under the Sun, Royal Academy of Arts, London (2010). George Grosz (1893-1959) lived and worked in Berlin, Germany. Studied Drawing at the Dresden Royal Academy of Art, specialising in Graphic Art (1909-11); the School of Arts and Crafts, Berlin (1912-14) and the Atelier Colarossi, Paris (1913). A prominent member of the New Objectivity Movement, a band of Social Realism in German avant-garde art, Grosz's work depicted and commented on German society between the wars. Also a member of Berlin's Dada movement, his caricatures critiqued the politics and culture of the day through satirical illustrations reflecting his observations of life in the city. Select exhibtions include Graphic Witness, Drawing Room, London, UK (2017); George Grosz: Correct and Anarchic, Akademie der Kunst, Berlin, Germany (2010); The Years in America: 1933-1958, David Nolan, New York, US (2009); German Drawings and Prints from the Weimar Republic (1919-33), Metropolitan Museum of Art, New York, US (2004); The Berlin of George Grosz: Drawings, Watercolors and Prints 1912-1930, Royal Academy of Arts, London, UK (1997); The New Objectivity, Galerie St. Etienne, New York, US (1997); Art and Politics in Weimar Germany, Galerie St. Etienne, New York, US (1993). Expressionist works by George Grosz are held in a number of public collections world-wide including Kunsthalle, Hamburg; the Staatliche Museum, Berlin; the Stedelijk Museum, Amsterdam; the Thyssen Bornemisza Collection, Mardrid and Museum of Modern Art (MoMA), New York, US.